Kate is having an amusing contest: the Look Back and Cringe Contest. On your own blog, explain to her why you don’t want 80s fashions to come back. Leave Kate a comment with a link to your post anytime through September 24th. Thanks to everyone who’s been sending me contest and swap information! Keep it coming – send an email to chris at this domain. Knitting update: Yup, I still knit. But gosh, it’s a bit challenging to knit with a kitten around – I’d forgotten about that! I’m about to bind off my first Regia Silk sock and I’m still plodding along on the border of my moderne log cabin baby blanket. Ummmm… Oh! Did I mention that I entered some socks in the Minnesota State Fair? Jeanne talked me into it and really, how could I refuse when she was willing to drop them off and pick them up from the Fair?! (Thank you, Jeanne!) I entered my Chaotic Black Lagoon socks (toe-up, using Maeve’s Cherry Blossom Lace pattern and Sundara Black Lagoon yarn). I got full marks for general appearance, color, design, condition (even though I ran out of time to block), and materials used, but only 35.5/40 for workmanship. Here’s what the judge had to say: “Beautiful Knitting – This was an extrememly competitive lot this year. Watch out for twisted stitches during grafting.” Interesting, since these were toe-up, no grafting required – but obviously I need to switch to the Turkish cast-on, as mine is leaving a row of twisted stitches. Tink and I are doing a mix cd exchange and Tink is way ahead of me (I’m still working on the mix). Along with the cds, she included some lovely little shells from Florida. Thanks, Tink! 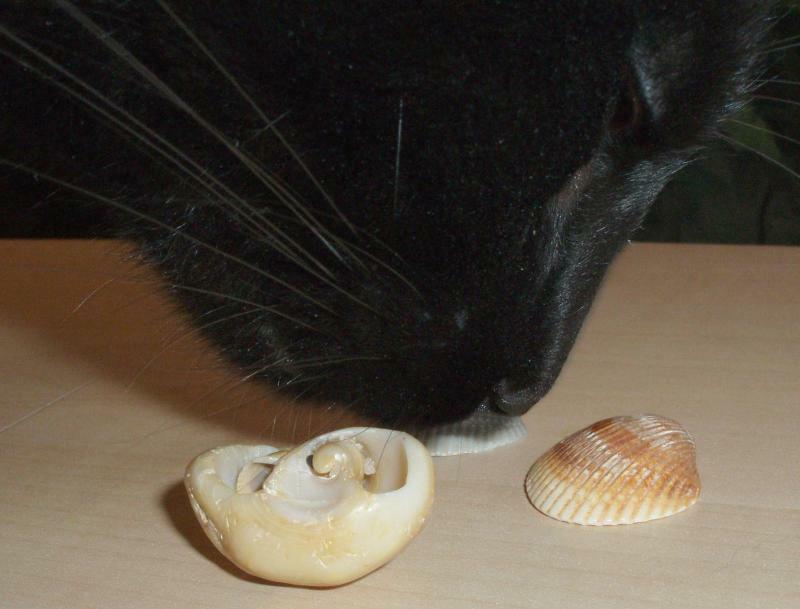 Chaos was intrigued by the shells. But eventually… the mouse flew from her grasp. Posted by Chris on Thursday, September 14th, 2006, at 7:02 am, and filed under Contests, Knitting, Randonymity, Those Cats. Oh, that’s so sweet, they’re playing!! It’s always a bit of a shock to remember how much work kittens actually are. But so worth it! Aw, so cute… Yeah, Gandalf keeps trying to tackle Atticus, who’ll put it with it only so long. Then along comes the beat down. I gotta remind myself it’s “play fighting”. Hey, where’d my State Fair comment disappear too?!! Anyway – did also say congrats on the sock score! But kittens are so cute! Awwwww! I was going through some old photos at my dad’s last night and I found some of me from a New Year’s Eve in the 80s. Oh my! The big hair was amazing! And yup, I had Zena jeans, too. Scary stuff. Mayhem is so cute. How is she adjusting to Chaos? And how is Chaos adjusting to her? “Oceany – but still, no tuna; what a rip!” See, that’s a caption. I love when they lay on their backs like that! 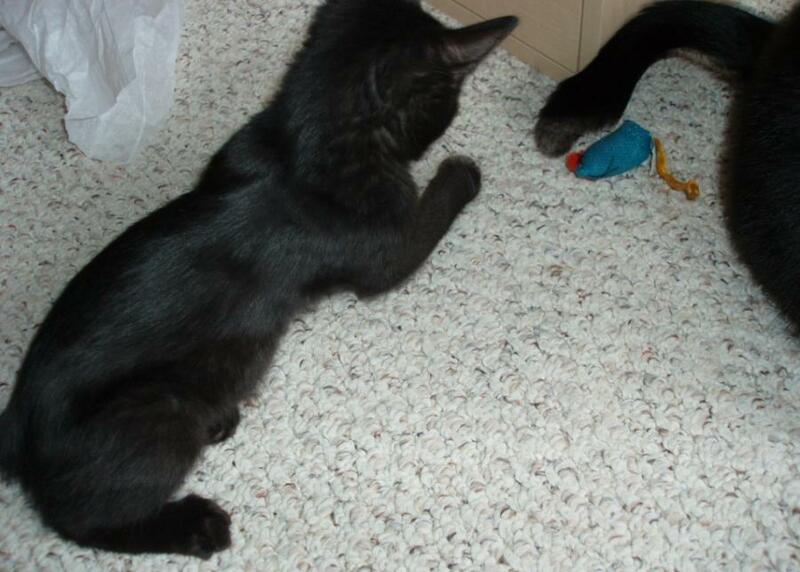 Mayhem, get that mouse before it gets you! I just want to come and snuggle May! 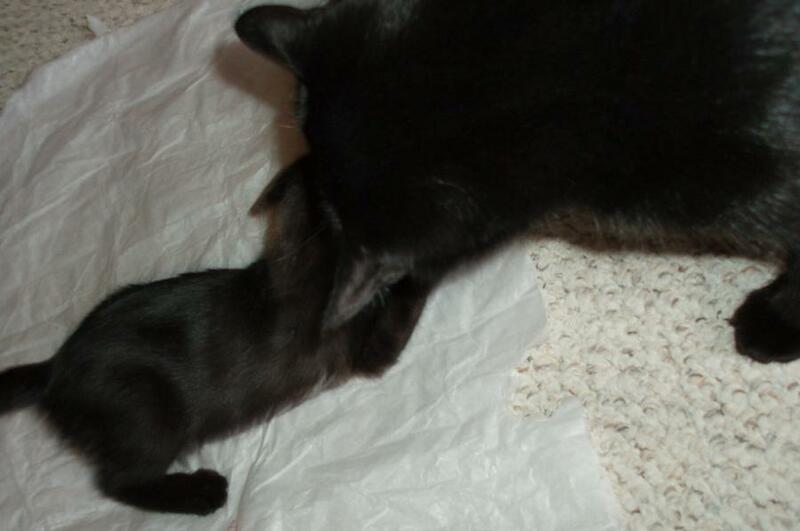 I miss having a kitten, but not the disruption it entails. Hmm… kind of like a baby! Hehehe. Those socks are seriously awesome. Too bad about the points docked for the toe, though. I’m so glad I never fell for the “big hair” or the purple eye shadow! You people in MN. take your knitting so seriously. Well, I think you did a great job! Love the title of today’s post, Chris. And baby May too. Congrats on your sock entry at the fair. Only a very seasoned sock knitter could have seen twisted stitiches, so kudos to you. Next year–blue ribbon! that mayhem is a lot to handle, poor chaos doesn’t know what he’s up against! Boy…Chaos seems so….~mature~ these days! They are too cute together! 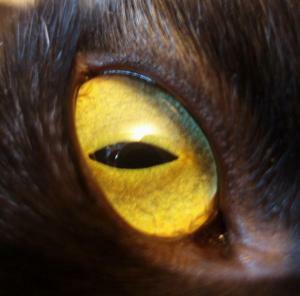 I can’t wait until I can get a younger cat to humilate Perry and put him in his place. Good for May! Chaos looks so big next to her in the last picture. Congrats on your fair marks! Is she too busy playing with her other new toy. My computer hasn’t been working for the last few days, so I am catching up – what a cute kitten! I’ll have to find my 80’s pics, I too had the big hair, perm, and purple eyeshadow. Its amazing how alot of my 80’s pictures seem to be related to alcohol too. What great looking legs you have, I think I had the same shorts too. Love the photos of Chaos and Mayhem, seems she well able to take care of herself. Congrats on the fair entry. Glad to see that the catnip mice have been put to good use!! There are definitely bad things about 80s fashion, I’m not denying it, but I still like them better than the tie-dye, hippie, 70s look . . .
congrats on entering your socks in the fair… you’re most brave 🙂 how silly tho’ that the judges did not know that it was knit toe up..it sorta negates their input eh? no matter what, they’re beautiful socks. and Yes… having just gone thru the “kitten” stage, I can assure you, knitting is a challenge. I STILL have to hide any yarn that is from a goat or alpaca.. they love the smell. congrats on the socks! twisted stitches are a problem for me, too, and I’m trying to avoid them. I ADORE MAY…she’s just too cute, (no, I will not…not…get a kitten) and sweet Chaos for not EATING her! Too cute!! Pao keeps saying that we are not getting a kitten. He’ll break soon. I was a new mom in the 80s, plus I was too independent (i.e., too old and too busy) to follow fashion, so I avoided the big hair and the purple eye shadow. And I kinda liked the shoulder pads — though not the linebacker-sized ones — b/c I have rather slopey shoulders. I wonder at what the 20-somethings of today will look back and laugh in 2030. There will definitely be something. I’ll take the 20 something body I Had in the 80’s, but everything else—yikes! Hi, I’ve been reading your blog for awhile now, but don’t think I’ve ever commented. Love all the pics of Chaos and look forward to watching May grow up. Aw, take your time with the CD. I’m just thrilled you like them… and Chaos seems to like the shells. I should have sent one with a crab in it for him to play with ;). as cute as May is… you can assure Chaos/Cosmo that I prefer them all grown up and broken in, thank you very much. I bet you’ve even lost sleep b/c may doesn’t sleep through the night (cosmo and danger started sleeping through at about 5 yo). LOL- the 80s. Ah the bag tops (band at top and bottom, bag in between, alas now in fashion), the bubble skirts (alas now in fashion again), knickerbockers – did you guys do knickerbockers? Or peach/apricot as a hot colour in the early 80s? Or black with emerald green, royal blue and magenta? Okay, if these pictures of May don’t change my husband’s mind, nothing will!!! We had nearly the exact same wedding do! I’ll have to post pics. congrats on the state fair marks! I’m to wimpy to enter anything. Those SOCKS are divine – that judge was a Grump. I wish I had one ounce of the kick-a-poo-flex that little one has – I can just see her sproinging with her back feet on that toy! That last picture of the two of them is adorable! Will Chaos play with her, or is he still appalled? May is just too cute. Knitting with a kitten around. I had almost forgotten what it’s like. Katie is six and she can still be a problem at times. Congrats on your State Fair marks! That’s still pretty darn good. Oh, the pictures of Chaos and May make me smile. 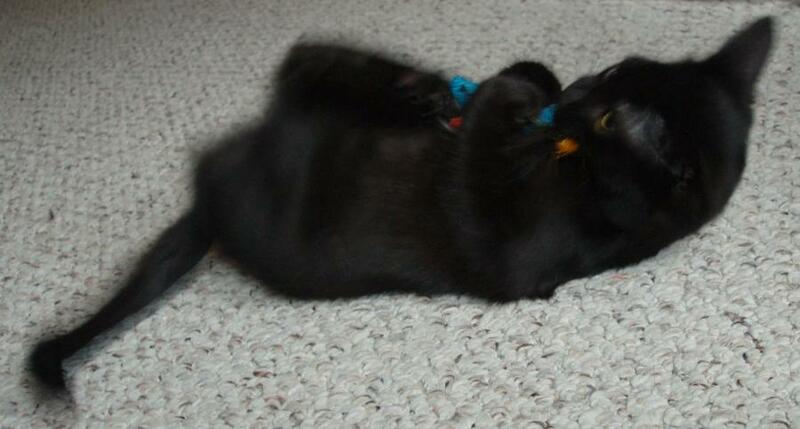 I know how challenging having a new kitten can be, but what fun watching her play!